Who say to believe them, not your own eyes. yeah, my beliefs are so rock-solid that i really need you to stop making fun of them. I hope you don’t mind but I share your work with the Maine Atheist and Humanist group on Facebook. Tom. You can lose every argument with people who argue dishonestly, or are unable to understand subtleties, or who reject reason altogether. What you never lose is the ultimate proof of the pudding: technology. The sum total of our technology (including biotech) is a powerful confirmation that our science-based understanding of the universe we inhabit is close enough to truth; close enough that it becomes useful. The religious world-view has shown no utility, unless you count the circular argument that “believing this will get you to into heaven”. Note that the argument from utility is still valid even if technology is used in evil ways. Ask: What does it do? What’s it good for? Of course not, Tom. Help yourself! On a related note–the university I work in is close to approving the ethics of a project to interview people who used to be in cults. Author was kind enough to say that I could advertise this on his page. Many thanks author. I’d love to know the “patronising” remark by the barmaid which sparked off this conversation. It could not have been very subtle, or it would have gone right over the boys’ heads! HelenaHandbasket, I do concur. In fact I’ll go one further, I am of the option that rationality and reason are not natural human inclinations, quite the contrary in fact. For the greater part of our history most of humanity has functioned largely without them. Even today, the world of science is but a thin veneer that shrouds our impulsive emotion driven species. We are still creatures of our ancestral environment and vast numbers of people are not now, nor may ever be, ready to give up faith altogether; such a universally evolved ‘inclination’ will be almost impossible to eradicate without changing our species. It therefore comes as no surprise to recognise an apparent tendency for many people to swap out one form unquestioning belief and fervour for another, albeit in an outwardly secular form. Extreme political and environmental fervour come readily to mind; for some these and other belief systems have an almost quasi-religious quality to them, right down to their own rigid dogmas, ‘evangelical’ zeal and even blasphemies. Misanthropy, for example, is not an established feature of any mainstream religion but it certainly appears to be on the rise in the secular world. I have been an agnostic atheist all my adult life and will engage practically anyone, anywhere on the subject – but I have seen enough to know that, for better of for worse, this will always be a minority disposition. We may soften or ameliorate the worst aspects of religion in some but it will never go away completely, how could it? The Soviet Union convinced themselves they had succeeded and now Russia is probably the most devout Christian country in Europe. Education won’t do it, not unless infants are removed from birth. You would have to transform entire cultures out of existence to even come close and with the accelerating rise of Islam good luck with that. Another brilliant cartoon. I love your work! I often use them to make points in my posts – a good cartoon is worth ten thousand words. Reid – “for the greater part of our history most of humanity has functioned largely without [rationality and reason]”? I’m skeptical. As soon as our ancestors had those faculties, we have plenty of use for them – figuring out what the band of not-so-smart characters in the next valley are up to, trapping critters to eat, making the connections between seasonal variations and plant foods, etc. Science hasn’t freed us from religion, the faith-based explanations for phenomena have always been a side-show. I’d rather guess that the intensity of religious faith has increased in modern societies, among believers (and I’m sure there have always been disbelievers, since day one of the religion game.) The ancestor worships etc. 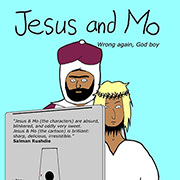 had ignorance going for them, but Jesus and Mo have an arsenal of psychological weapons unknown to the witch-doctors. So … the way forward? You’re right, it isn’t science, or reason exactly, it’s where we figure out how to beat them at their own game, minus the fantasy and dogma. Philosophy in life, like the Stoic philosophy of ancient Greece. Can you sell something like that, without preposterous promises like eternal life? You can sell anything, if you know how, they say. Reid, all that Russia proves is that people cannot be forced to abandon beliefs, and when one tries to do so it merely drives the believers to worship ‘underground’ until a regime change enables them to do so openly again. It isn’t as though everybody abandoned belief, later to pick up where they’d left off. I think that the Communist Party leaders knew this as well; why else leave so many churches, cathedrals, etc. standing when they were on perfectly good land which could have been better used for housing or business/governmental purposes? Your mention of the growth of Islam is also possibly not quite so straightforward as all that. Is there genuinely a global increase in Muslims when factors such as general population growth are taken into account? Are the figures skewed because Islam has retained a greater proportion of followers as a percentage of the population as other religions are declining in number? Finally, and this is my take on things, is Islam really on the rise worldwide or is the perceived increase more down to population drift and higher visibilty of Muslims in the West? Muslims are coming to Western Europe, the U.S.A. and Canada in increasing numbers, either as refugees or straightforward immigrants, thereby increasing their presence in so-called ‘Christian’ countries, but also reducing the total of Muslims in their countries of birth? Addendum to above re. Russia. As another example of the ineffectiveness of forceful suppression of religious belief, just look at the passing back and forth of the British Crown between Catholic and Protestant monarchs, such as Mary and Elizabeth I. (The same situation has been writ large over many parts of Western Europe at one time or another). Each monarch outlawed the other religion during their respective reigns, but the adherants to the faiths simply worshipped in secret until the Crown went back to a Monarch of their own faith. Reid Malenfant, In some countries of western Europe the percentage of believers in the population has shrunk drastically. I suspect that in a stable democracy, reasonably prosperous, with a comprehensive “safety net” sort of welfare state, people just don’t feel enough fear and anxiety to motivate them to pray. With universal literacy and a reasonable education (about the modern scientific understanding of the world), they no longer have any emotional need to believe in a Cosmic Parent that will protect or rescue them from their troubles. Belief is declining in the U.S. as well, though the decline started later and lags far behind Europe. As someone living in one of the most secular countries in the world, Sweden, I have been wondering exactly how it happened and what features of religion still remain. The Swedish church has retained the role of servicing people with weddings, funerals etc. It is very common to still participate in confirmation (usually done in the form of summer camps), although in most cases neither the children nor their parents believe. It’s largely regarded as general ethics training or cultural education, I think. Churches arrange concerts, a lot of people sing in a church choir. In some ways we have an almost “don’t ask, don’t tell” relationship with priests. They don’t ask if we believe, we don’t tell them we don’t. We let them talk some about God and Jesus since it seems to make them happy. Most of them focus on general ethics and providing services to a modern society though. Quite successfully you might say, since the majority of the population are still members of the church although they do not believe. It’s perhaps more of a contribution to allow them to maintain the cultural heritage (buildings, music etc.) or to do social work. The social democratic movement that dominated politics during the 20th century (and still does although it is declining some) probably also replaced some of the religious needs in that it had a strong collectivist component. At present there is a discussion to what extent the church was infiltrated by the 1968 left movement, which now seems to dominate at least some parts of the church. The recent influx of people with strong religious beliefs from other cultures is also creating tensions, with the church being almost unable to take a stand against persecution of Christians in the Middle East for fear that it might strengthen the nationalist party, the Sweden Democrats. In this duck pond that is pretty much the focus of absolutely everything, relevant or not, domestic or foreign – will it benefit the evil party? An attitude that of course has the exact opposite effect of what is intended, especially as some parts of reality are not quite aligned with the official narrative. It is amazing how quickly wishful thinking in combination with conformity managed to empty the “public conversation” of intellectual honesty in this consensus culture. Suppression of blasphemy seems to be a strong drive. All it took was a moral dilemma that no one wanted to acknowledge existed: How can a country of 10 million live up to the sanctity of the right to asylum, abundance and happiness for all in a troubled world of seven billion without perishing in the process? At this point intersectionality seems to be the dominant belief for a substantial part of the population, so maybe there was a latent religiosity that was channeled into that. Nationalism probably also fulfills some of the same needs for another part. Supernatural figures might not be necessary, but social cohesion, rituals, an ideology to believe in, common ethics and possibly some authority figures to look to for answers might be. Experiencing meaning in life may be important for some people (not for others). For those for which that is important, learning and understanding that meaning ought to be a continuing work of reflection and personal exploration, underpinned by knowledge of the world. Religion supplies a prefab version of meaning, without the work needed or the full benefit. It is to the above personal exploration as McDonald’s burgers are to a meal at home cooked with proper nutrition and flavor in mind, for family. The McDunghill burger supplies something, as does organized religion, but both are poor substitutes for the better options. Laripu. 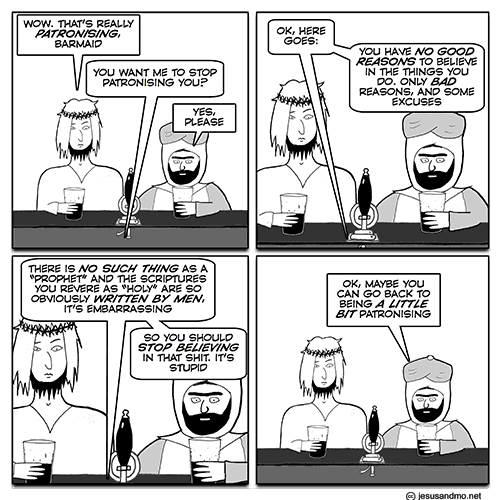 Oh, religion doesn’t give my life meaning, I assure you. And the mere fact of something giving someone’s life meaning doesnt, of itself, morally justify it–e.g. we are seeing an awful lot of people for whom white supremacy gives their life meaning. This came a surprise to a lot of us, I think, a not a nice one. But–I can’t escape the fact that 1000s of women in the UK convert to Islam per year. They aren’t being forced to. It’s giving them something. We secularists need to have a long hard think about what it’s giving them and try to offer something that does the same job without the attendant harms (ditto white supremacism, and for similar reasons). At the moment I cant see many people whose job this is to help people negotiate issues of identity and culture (journalists? cultural commentators?) doing anything more than mouthing platitudes. A case in point. Owen Jones. Now–I want to like Owen Jones. I’ve met Owen Jones a couple of times and he’s a nice guy. (Also, helpfully pocket-sized in case you want to transport him somewhere). But when he starts talking about Islam (say) he’s seriously out of his depth. All he’s got to draw on are the thin platitudes of the left and he looked especially ridiculous flouncing off that TV show when someone pointed out that explicitly religious homophobia might have had something to do with an explicitly religious homophobic mass murderer. We deserve better pundits. If anyone can think of any then please share. The last thing one who depends on belief for his reality wants to hear is the truth, because that will upset his applecart and threaten the balance of cognitive dissonance he has worked to achieve. I just read Saudi Arabia are finally going to let women drive – eventually. First they need to figure out how to educate women in the ways of driving, and how to educate police offers in fairly treating women (bound to be unrelated to them) as they follow the rules of the road. Very simple for practically everyone else in the world but very complex for them (and only a little bit patronizing). Shakespeare, as always, understood and had Theseus sum it up. It comprehends some bringer of that joy. The evolution of the human brain enabled the development of imagination, the vital tool for planning and empathy. The possible downside, as the Bard so rightly observed, was the confusion of the imagined with the truth; thus the arrival of the shaman or the seer, claiming to interpret the imagined into the real. As long as people are reassured by believing that the bush was actually a bear religion is likely to persist. Choirboy, I’d much rather mistake a bush for a bear and act accordingly, then mistake a bear for a bush and get eaten. Acolyte, in practical terms you could be right if we take the metaphor too literally. I included the word ‘reassured’ to suggest the foolishness of those who believe that the bush was not only a bear but are blinded to its dangers and convinced by the shaman that it is actually worthy of, indeed demands, worship. He would probably find it much harder to get a bush worshipped whereas the imagination of the perceiver ‘in the dark’ has done most of the work for him. The couplet at the end of course just sums up the ease of confusion between reality and ‘strong imagination’. The most telling phrase for me is, ‘gives to airy nothing a local habitation and a name’ which adds the intervention of the ‘poet’s pen’ (read shaman or priest?) to exploit the normal imaginings or dreams natural to the developed human brain. It’s always seemed to me that the Bard was making a risky suggestion of atheism at a time when it could have had him on the pyre.